Prior to real estate, Lauren managed a busy local restaurant so she is always ready to hustle, pays attention to details, knows how to put out fires (figuratively and literally) and firmly believes the customer is always right. Lauren moved to Amelia Island in 2006 from St. Louis, Missouri. She studied Strategic Communications at The University of Kansas and earned a BS in Journalism. She lives on the island with her husband Brett, a talented Amelia Island chef and her two children, Finnigan and Violet. 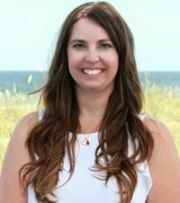 Lauren can't wait to help you find you your dream Amelia Island home!